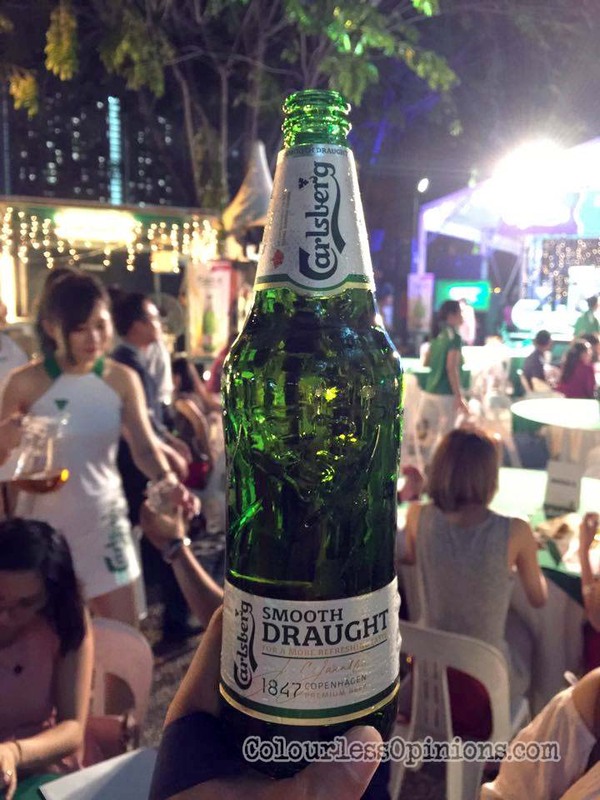 Carlsberg Malaysia launches Smooth Draught beer — easy to down! Following its tagline “probably the best beer in the world“, Carlsberg now delivers smooth sensation of freshly tapped beer through their newly launched invention: Carlsberg Smooth Draught beer. The product is said to be brewed longer for smoother beer with an easy finish and that freshly tapped smooth sensation can be enjoyed anytime, anywhere from a bottle. Available in big bottle of 580ml with 4.8% alcohol by volume, Malaysia is the first Carlsberg market in the world (out of 140 of them) to launch this product. It started out as special edition in March before it’s now made permanent due to overwhelming response from the trade. Along with the invited media, bloggers and trade partners, I’ve had the privilege to enjoy as much as I wanted to at the launch event yesterday held at Carlsberg Brewery, Shah Alam. When they say “easy finish”, it’s no joke. Carlsberg Smooth Draught is truly smooth and easy to consume and yet that trademark Carlsberg taste is very much present in every sip. The beer was just as enjoyable with the usual Chinese restaurant food like fried chicken and steamboat, the way I had it at the launch. My girlfriend went from “I drank quite a lot but I don’t feel anything” to falling asleep as soon as we got home with her contact lenses still on. “Very often, consumers yearn for the smooth sensation of a draught beer but this is not readily available in eateries, food courts and coffee shops that they frequent. Carlsberg Smooth Draught is the answer to many beer lovers’ quest and caters to a consumer preference for the smoothness in a draught beer. It captures the smooth sensation of freshly tapped beer in a bottle, so consumers can now enjoy a smooth brew anytime anywhere at an affordable price,” said Henrik Juel Andersen, the Managing Director of Carlsberg Malaysia. What's the live band name that performing on that night? Can't recall and it's not mentioned in the press release. Reminds me of the one at Bersih 4.